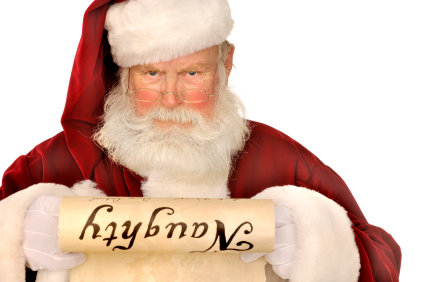 DON’T GET PUT ON SANTA’S NAUGHTY LIST!!! All naughty entries will receive a copy of the notice by mail with suggestions to improve for the following year. After two annual notices, you will be asked to retire your float in the toy shop permanently. All entries must include appropriate Christmas decorations and lighting. Only Christmas music is to be played or performed from floats and must not interfere with other floats. Parade entries must not include a Santa Claus. There will be only one Santa in the parade and his participation is already arranged. No candies or other handouts during the parade. Entry handouts will be distributed to the crowd by our costumed characters at 5:15pm. The direction of the parade west on Ste. Anne, south on Elgin, and east on Cedar, north on Durham, east on Elm, and finally north on Elm. All walking participants not in organized marching groups must have illumination for safety reasons. All parade participants must adhere to Parade Marshall’s instructions including direction from security personnel. Failure to comply with Parade Regulations may result in a ban from future parades. All participants must complete an entry form. All drivers must be in possession of an appropriate valid drivers license and insurance. Vehicles / floats cannot be greater than 80 feet in length, 10 feet in width or 13 feet in height from the ground up. The use of horns is forbidden ie: air-horn or conventional horn. Participants must remain on floats during the parade and adult supervision for children is required. All walking participants not in organized marching groups must have a type of illumination to ensure adequate visibility for safety purposes. All animal entrants must have a clean-up crew following them the entire route. All animals must have a type of illumination to ensure adequate visibility for safety purposes. The attached map outlines the marshalling and disbursement areas. Marshalling begins at 1:00 p.m. You will be advised one week prior to the parade of your arrival time and location in the parade. Only floats and support vehicles will be allowed in the Marshaling area. Be sure to give clear direction to parents of any children you might be organizing for your float. Children in the marshaling area must be supervised at all times. All parade entries must be in place by 5:00 p.m. The parade will finish at the corner of St. Anne’s Road and Notre Dame (Please see next page for further details). All entries will re-enter the marshaling area for tear-down and dispersal (Southbound lanes on Notre Dame Avenue). Those picking up children and/or participants after the parade are strongly encouraged to meet at a location outside of the disbursement area. Parade entry awards evening; for the children's choice, floats, bands, marching groups and will be presented on December 5, 2018, 7:00 pm at Northern Water Sports Centre. The Judges for the Parade are generally selected from our honorary chairs and major sponsors . Judges location will be announced prior to parade start. Please ensure your entry number is prominently displayed. Plan for your entertainment to really “shine” while passing the judges. The Traffic Management Unit will undertake all necessary road closures, traffic rerouting, and traffic control points to ensure the safety of the parade participants and attending pedestrian spectators. Our Unit understands the motoring public will be slightly inconvenienced on the afternoon of the parade, however, we believe these measures are necessary to successfully meet our mandate. Southbound lanes on Notre Dame Ave will be closed between Kathleen St and Ste Anne Rd at 1:00 P.M. The downtown core will be closed to vehicular traffic at 5:00 P.M. until approx. 8:00 P.M. Parking will not be permitted along the parade route -- Elm St, Durham St, and Elgin St. Proposed route: The direction of the parade west on Ste. Anne, south on Elgin, and east on Cedar, north on Durham, east on Elm, and finally north on Elm. Officers along the route will assist traffic destined for downtown as much as possible tomorrow afternoon; however, motorists are encouraged to plan an alternate route.